Hand cut and sewn leather wallets from Italy. We carry styles ranging from thin clasp to larger organizer wristlets. All are made in small artisan workshops in central Italy from eco vegetable tanned Italian leather. An Italian leather wallet makes the perfect, long lasting gift for yourself or someone you love. Elizabetta Boutique brings you unique luxury fashion accessories and handmade leather bags direct from Italy. There are no middlemen, so you pay less. Founded in 2004 by Elizabetta who sources the finest quality 100% Italian fabrics in the latest colors, patterns and styles which are then hand crafted in Italy into beautiful scarves, shawls, ties, pocket squares and other fabric accessories. We design and manufacture our own exclusive Elizabetta specialty luxury items in addition to bringing you some of Italy's other fantastic high fashion designer labels. Our leather handbags, travel and business bags are handmade by small artisan companies in central Italy. Every item in the boutique is made in sweatshop free, eco-conscious, fair labor family run small businesses in Italy. These same companies also produce for very high-end fashion houses using the same fabrics and techniques. Beautiful, classic and fashionable styles in for both women and men. Every season in the boutique we offer new styles, keeping up with the latest fashion trends. Here at Elizabetta we want you to own something quite special and we love to design, create and seek out that something special for you - It's our passion. 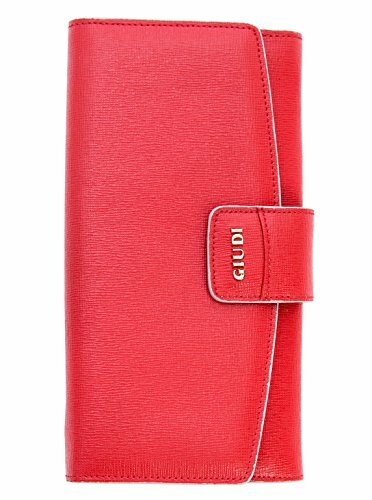 This textured scratch resistant red saffiano leather clutch wallet will keep your essentials organized in style. Inside is a beautiful pale grey smooth leather and a signature satin lining. Multifunction, there is a pocket and slot for all your cards and billfolds. Gold tone hardware and signature logo. 12 card slots, Inner zippered double compartment coin pouch, 3 slide pockets, 1 mesh document pocket, 2 smaller side pouches and 2 billfold compartments. Large Clutch 7.5"w x 3.75"h x 1.5"d (19 x 9.5 x 3.5cm). Comes in a signature box. Handmade in Italy from eco vegetable dyed Italian leather. Signature satin lining. Comes in a signature box. If you have any questions about this product by Elizabetta, contact us by completing and submitting the form below. If you are looking for a specif part number, please include it with your message.